I mentioned in my last post that this past Monday was our Canadian Thanksgiving. We were going to celebrate at the cottage with a Sunday evening dinner, having my in-laws over, along with my brother and nephew. Thanksgiving dinner for 8. Seeing as my brother and nephew were arriving for Sunday lunch, I needed to plan for that as well. 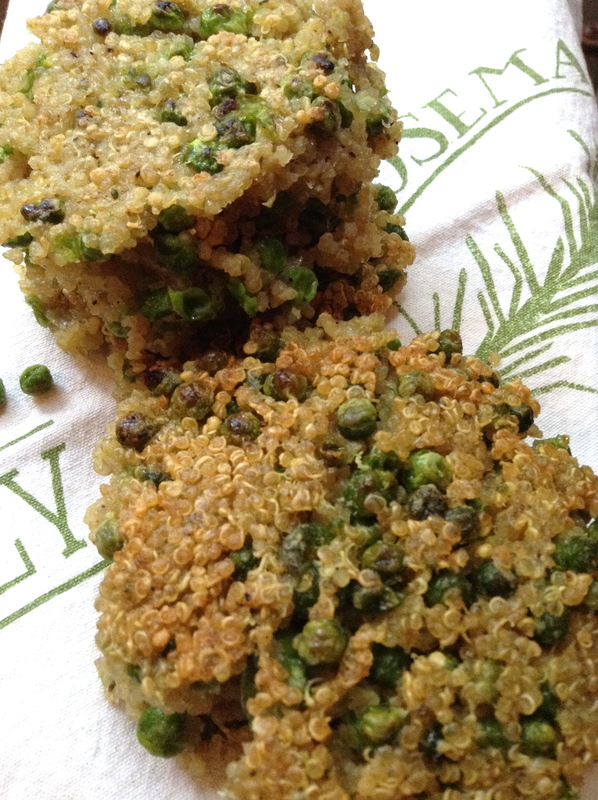 On the lunch menu were these gorgeous and amazingly delish Quinoa Pea Fritters, from Leah over at sharing the food we love. Mine were nowhere as gorgeous as hers, but I bet they were just as scrumptious! Served with a tomato salad, some Italian cheeses and crusty bread, it was just right. 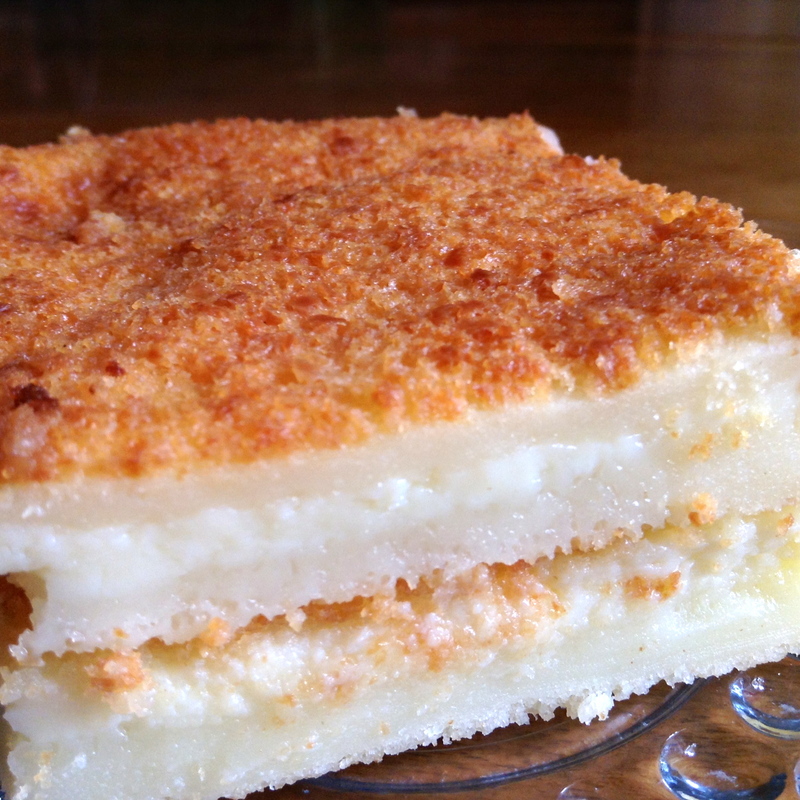 And for dessert, this luscious Cheese Pudding, from Erika over at TEA WITH ERIKA. Not as high and pretty as hers, but Oh! So divine! I cheated by doubling up the slices and made them look just like Erika’s! 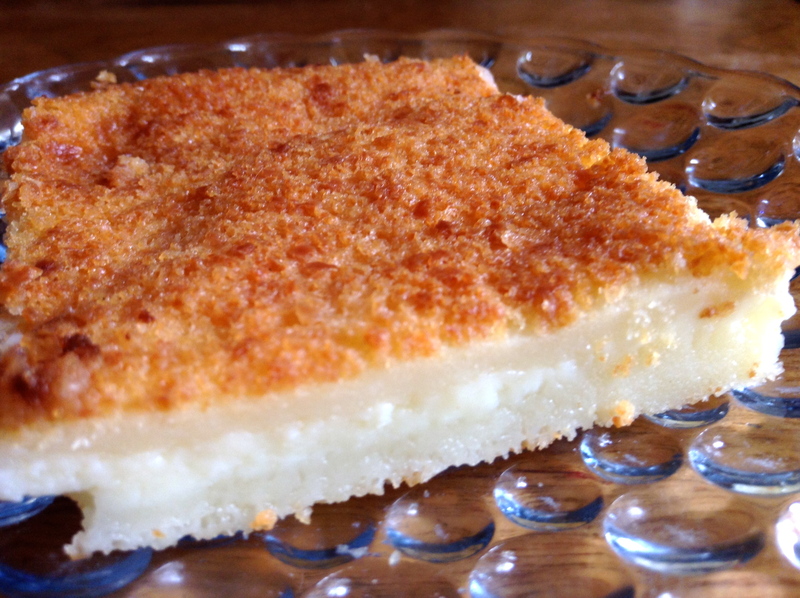 Creamy, milky, yummy! Now, onto dinner. 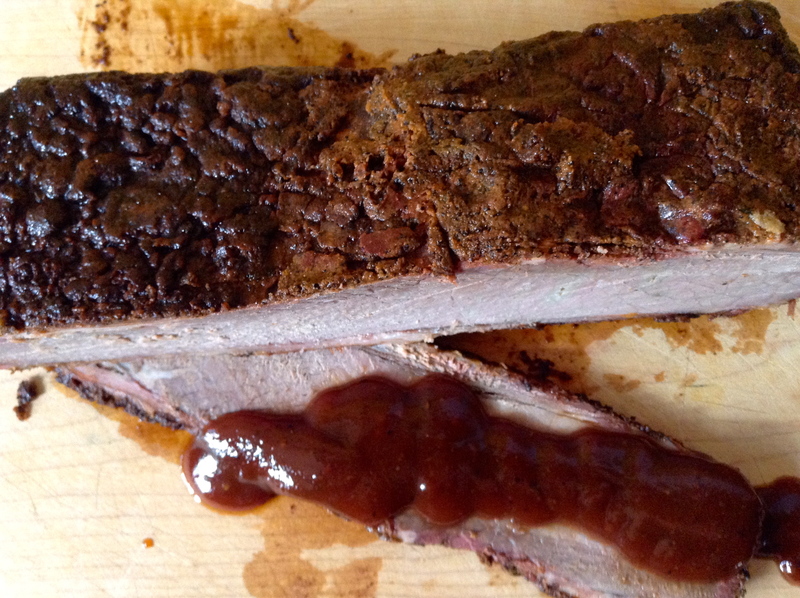 Wanting to take advantage of the gorgeous weather and wishing to extend the BBQ season, I decided to try smoking a beef brisket on my charcoal barbie. Non-traditional, I know, but we have turkey enough throughout the year. I wanted to try something different. As I set off Friday morning to buy my brisket, hubby called to let me know that his mom announced that she was going to roast a turkey on Sunday and bring it over for dinner. Her cottage is down the road from ours, you see. 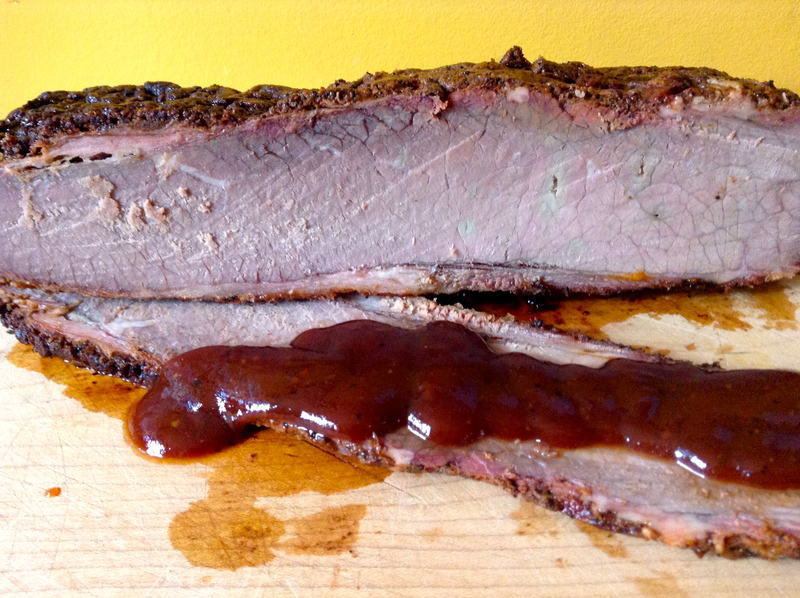 “Did you tell your mum I was smoking a brisket?” “No.”, he replied, “But that’s fine. 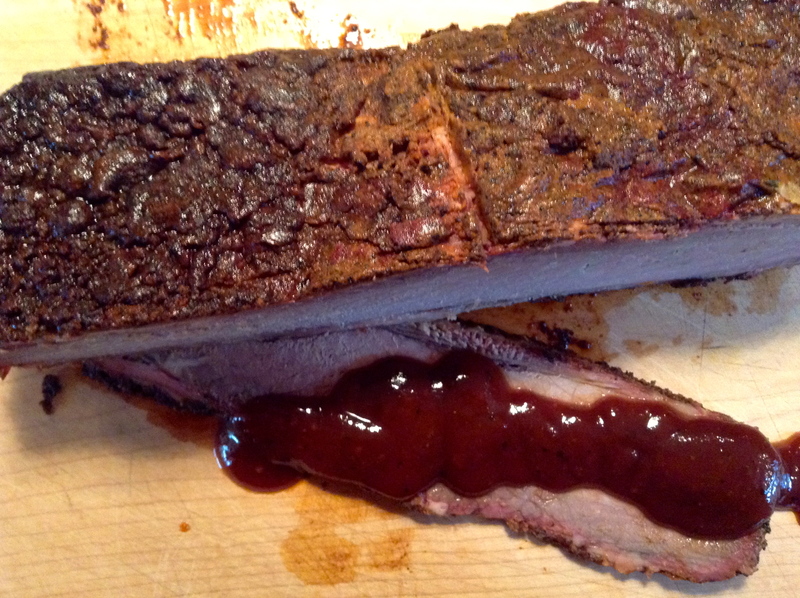 Go ahead with the brisket, we’ll just have both and the brisket can be eaten throughout the week.” Fine by me. My brother didn’t mind not having turkey, Italians don’t really do turkey. My nephew, on the other hand, thought it was sacrilege! He likes his turkey and all that comes with. The stuffing, mashed potatoes with gravy, the cranberry sauce. Needless to say, he was quite happy to hear that my mum-in-law was coming over with a traditional Thanksgiving dinner. I was down by the lake late Saturday morning when I could hear my mum-in-law having a discussion with hubby up at the house. It seems that in her hurry to leave for the cottage Friday morning, instead of grabbing the turkey out of the freezer, she grabbed a chicken by mistake! A 7 pound chicken! She had the stuffing already made, the cranberry sauce too. So she was going to stuff the chicken! Hubby wasn’t thrilled. We’d had roast chicken 2 nights before. When we told her of my nephew’s relationship with turkey, she drove to town, 20 minutes each way, and went to 3 different grocery stores looking for a fresh turkey. No such luck. Two hours later, she returned with a second chicken! Which she wanted me to stuff and roast. Along with boiling the potatoes and carrots she was going to bring over to me the next day. In addition to smoking a brisket over a period of 6 hours, making broccoli salad, and dessert! Which wasn’t my traditional pumpkin pie. When my nephew said to me, “You made your pumpkin pie, right?”, I made the decision that for the first time ever, we would be celebrating American Thanksgiving this year. With roast turkey, stuffing, cranberry sauce, mashed potatoes with gravy, and my pumpkin pie! 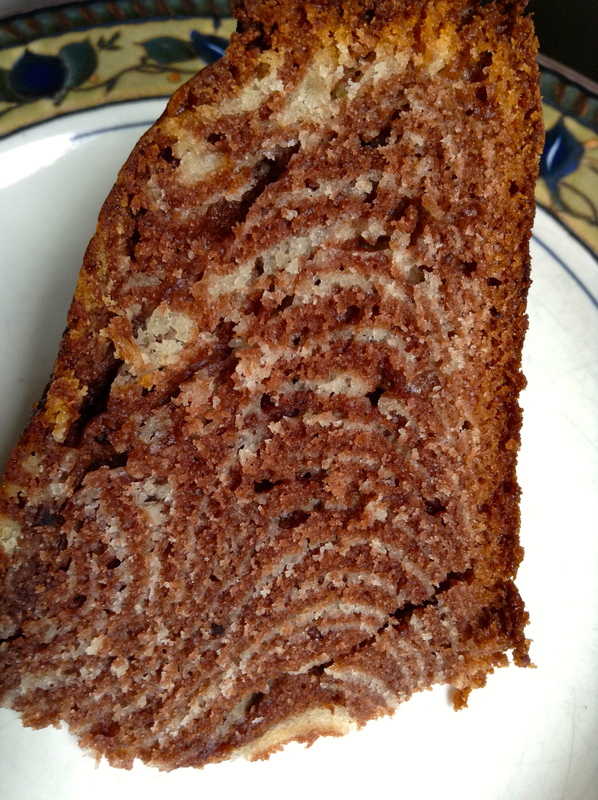 Instead, what I did serve for dessert was deliciously moist Zebra Cake, from Fae over at Fae’s Twist & Tango. Although my zebra cake didn’t turn out as exotic-looking as Fae’s, it was perfect. And as Fae tells me, no two zebras are alike! 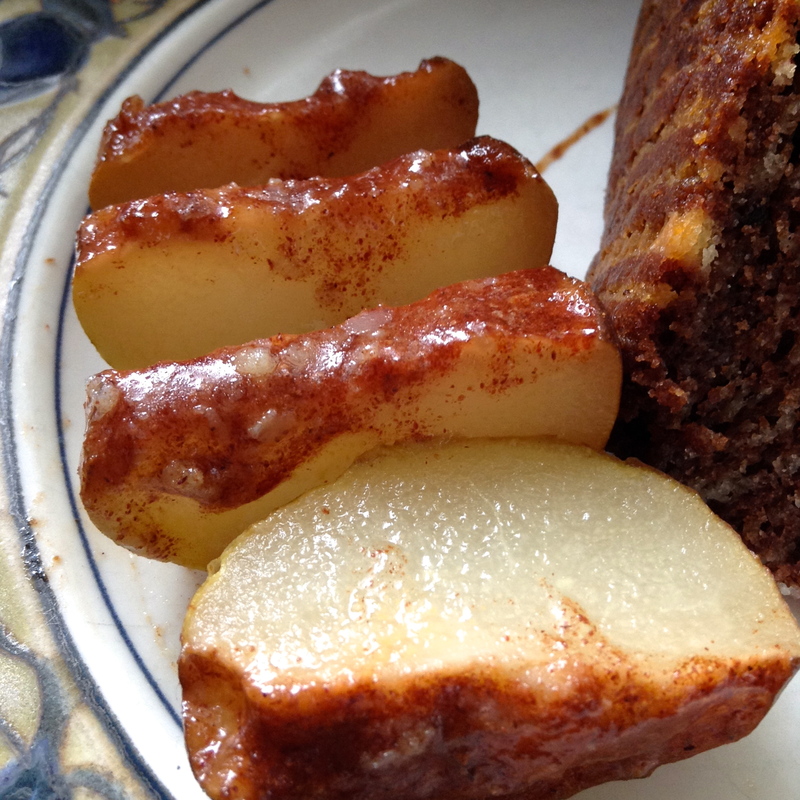 Along with this yummy cake, I served up succulent Spiced Roasted Pears, from Suzanne over at a pug in the kitchen. 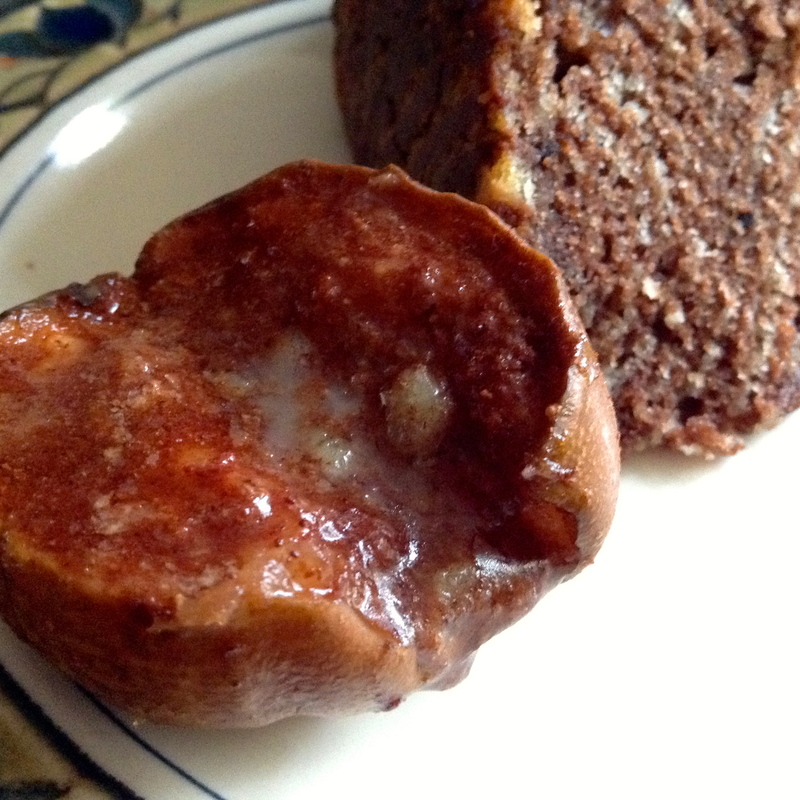 I used Asian pears which we picked up on our apple-picking trip and they were truly delectable! 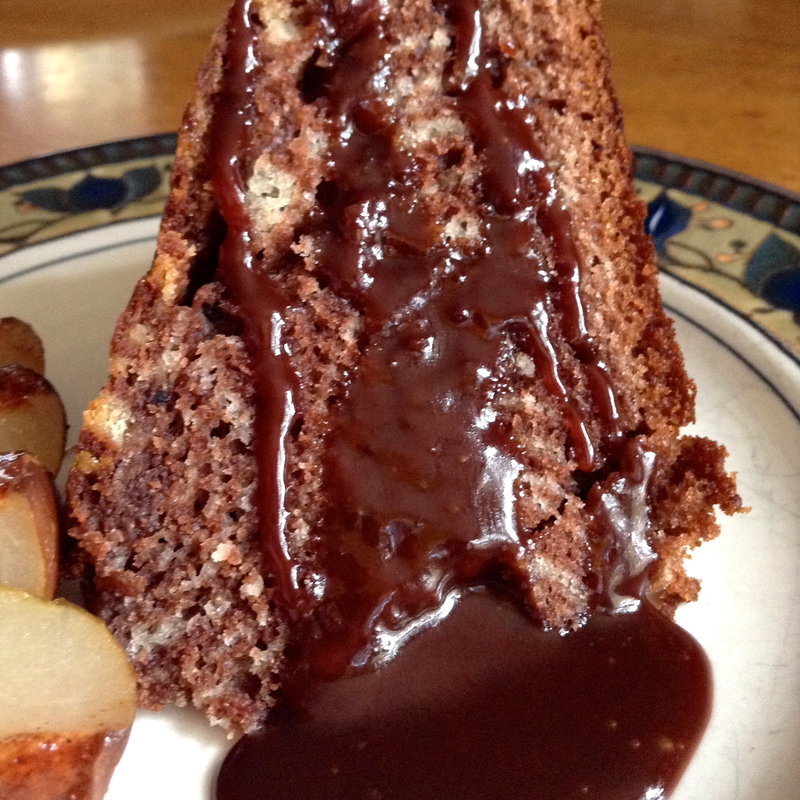 With the Roasted Pears sliced up alongside the Zebra Cake, I poured this incredibly decadent Chocolate Caramel Sauce, also from Suzanne over at a pug in the kitchen. Hot dang, that sauce was incredible! After the first bite, everyone grabbed for the dish and poured loads more. I could have served it up in a tea cup and they would have drank it! Me included. 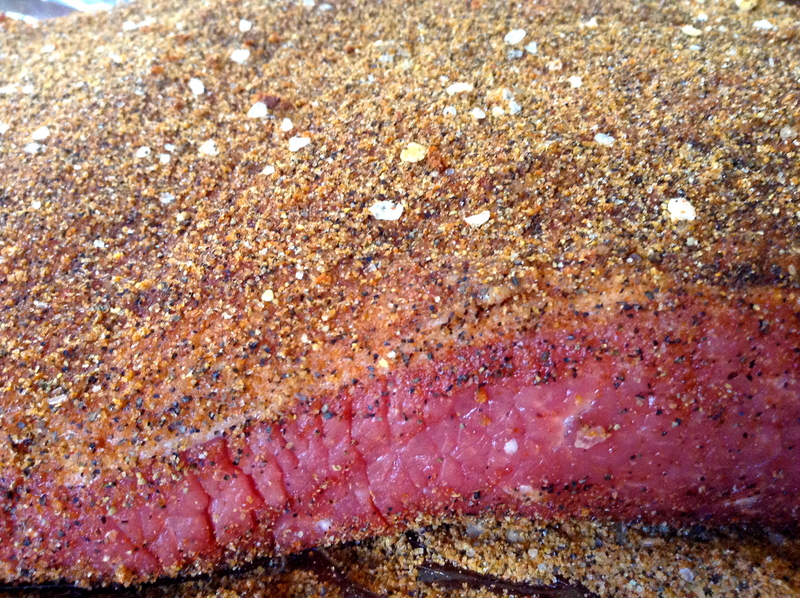 As for the smoked beef brisket? 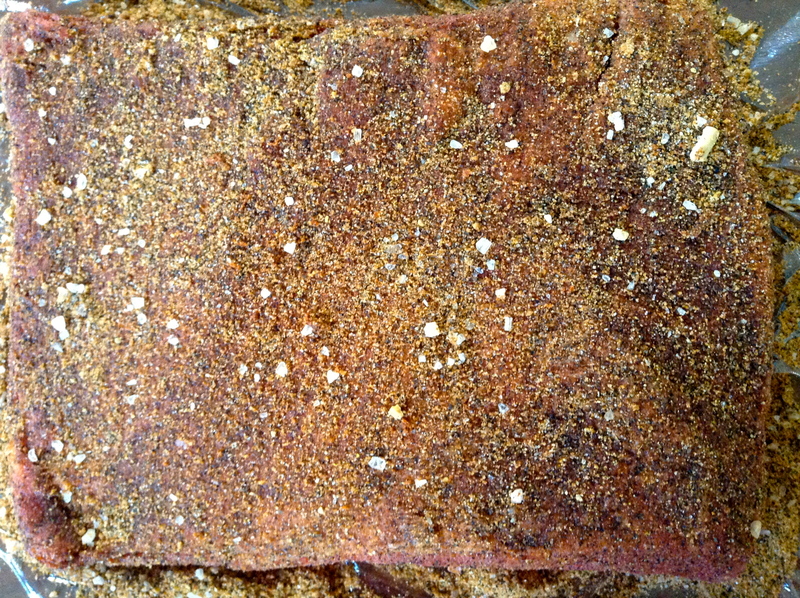 Rubbed with brown sugar and various herbs and spices. Marinated overnight. And smoked over mesquite wood for 6 hours. Oh man! It was smokin’ good! For my first time, I was quite pleased. I’ll make a few adjustment for the next time, and it can only get better. 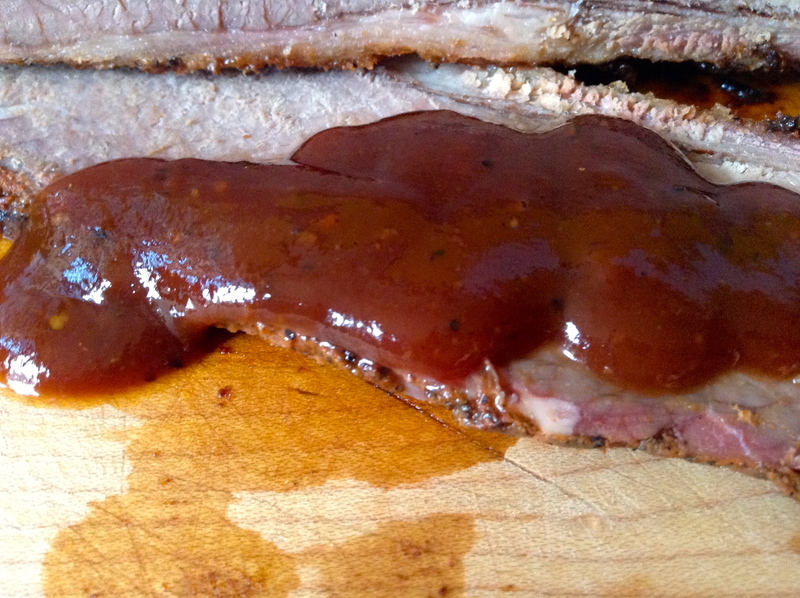 Served with a hot Bourbon BBQ Sauce, it was just right! The stuffed roast chickens were great, as was every other aspect of our meal. At the end of it all, my mum-in-law came to me and exclaimed how pleased she was with everything, “Oh Lidia! Everything was so good. And how nice for me not to have to cook. Thank you!”. And she kissed me. Isn’t that what Thanksgiving is all about? To show your appreciation and give thanks to those you love! What a feast, everything looks incredible and thank you I am really honored that you chose one of my recipes to grace your Thanksgiving table. Thank you and a very happy Thanksgiving to you and your family. 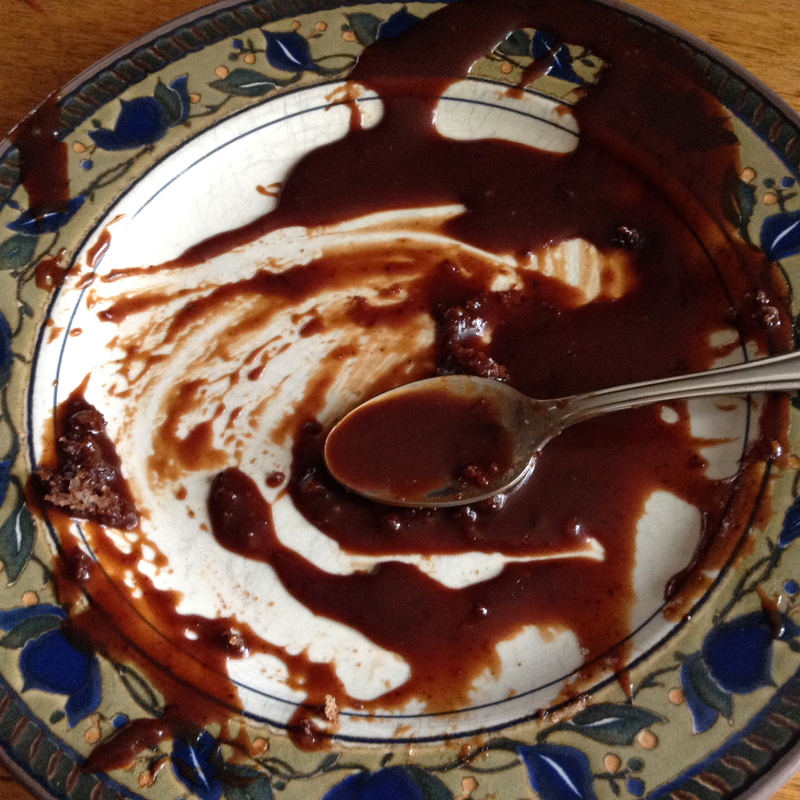 Your chocolate-caramel sauce rocked Suzanne! It’s a definite keeper! You were there in spirit Fae! Oh my, the pears look lovely. 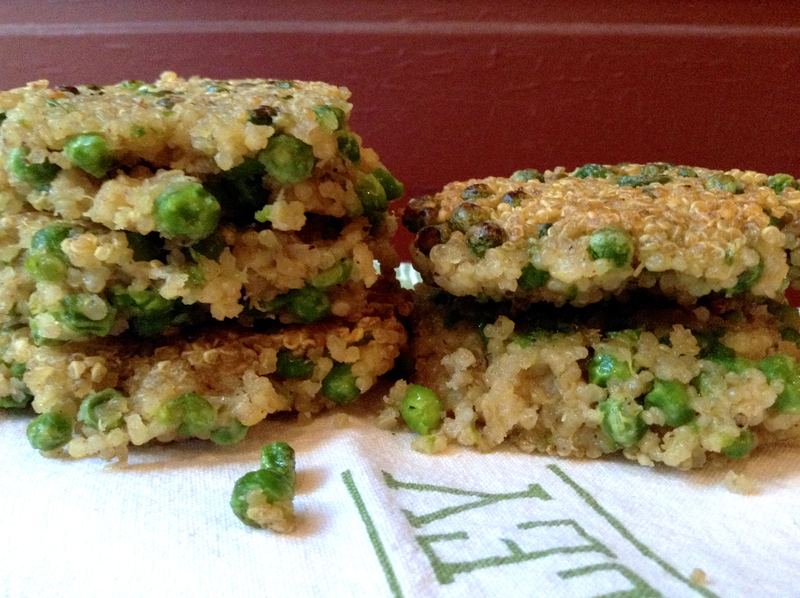 I love making quinoa cakes – your look crisp on the outside and soft on the inside – divine. Thanks for sharing your Canadian Thanksgiving with us all. I’m glad I made you laugh Shanna! Well, that mix-up means we’ll be celebrating American Thanksgiving with our friends south of the border! It was a great meal nonetheless. Thanks John! Thanks Leah! And wouldn’t it be great if one day we could have a proper live gathering and enjoy a feast together? Cheers! Just wonderful, Lidia. 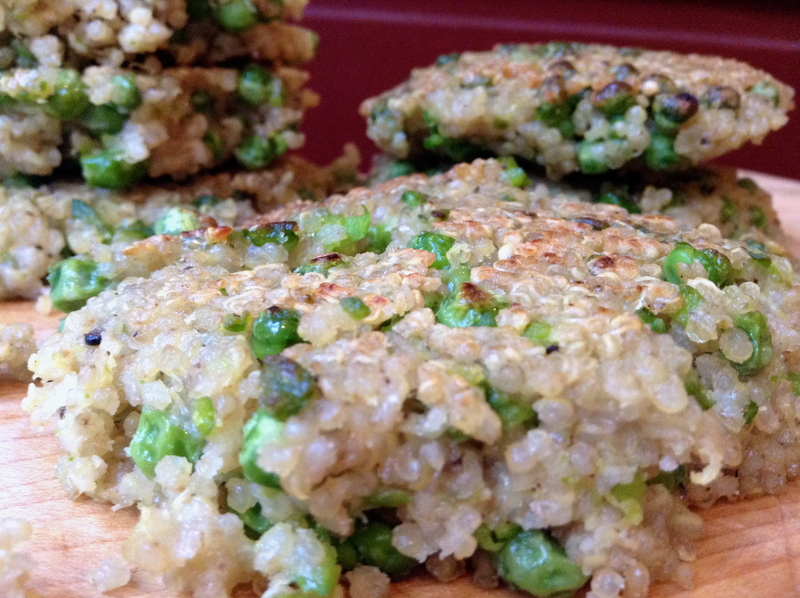 Your writing is head and shoulders above the typical food blogger’s. And your recipes….well, they’re just wonderful, too! You are always so kind to me Marina. Thank you! I’m glad you enjoyed Rosa! What a lovely feast! Isn’t it great to throw tradition out of the window sometimes? 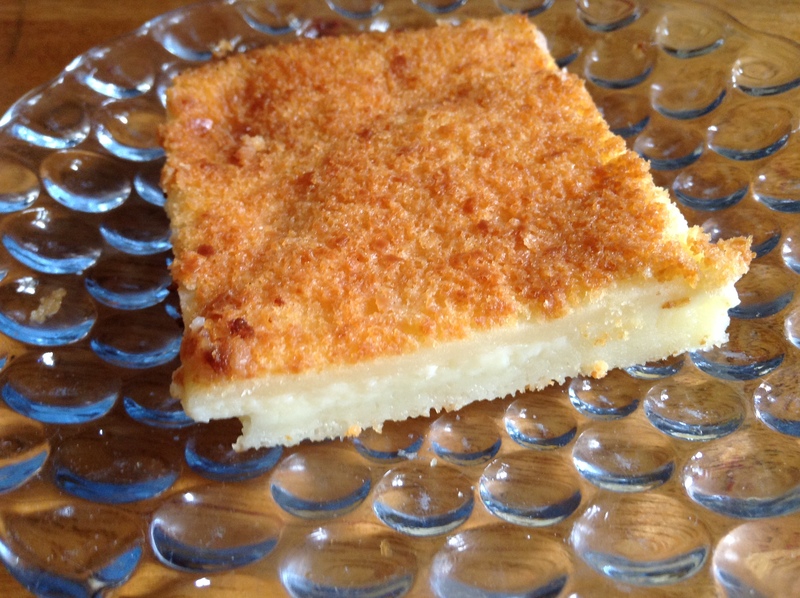 🙂 Thank you ever so much for featuring one of my recipes! It looks gorgeous just like everything you do! It was a lovely feast indeed Erika, and thank you for your luscious dessert! Everything looks incredible! It looks like it was a lot of fun! We really did have a good time Tasty Treats. My girls decorated the table with fallen leaves of red, orange and yellow, and pretty little acorns too! It was a wonderful family weekend Margot. I always serve way too much food during our festivities, but left-overs are always great! 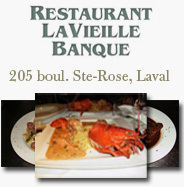 This looks like an incredible gourmet meal, perfect for sharing with family at Thanksgiving. I was wondering why we always make the same old meal every year.. this was a treat to read about! That is an amazing amount of cooking for one post. I would have made a series out of it. Well done. Trust me Connor…this was an amazing amount of cooking for one day!! Thank you Bam! I thought it would be fun to have some of my fellow bloggers representing at my dinner table. Thanks Nell! It was all good fun, regardless of any mishaps. 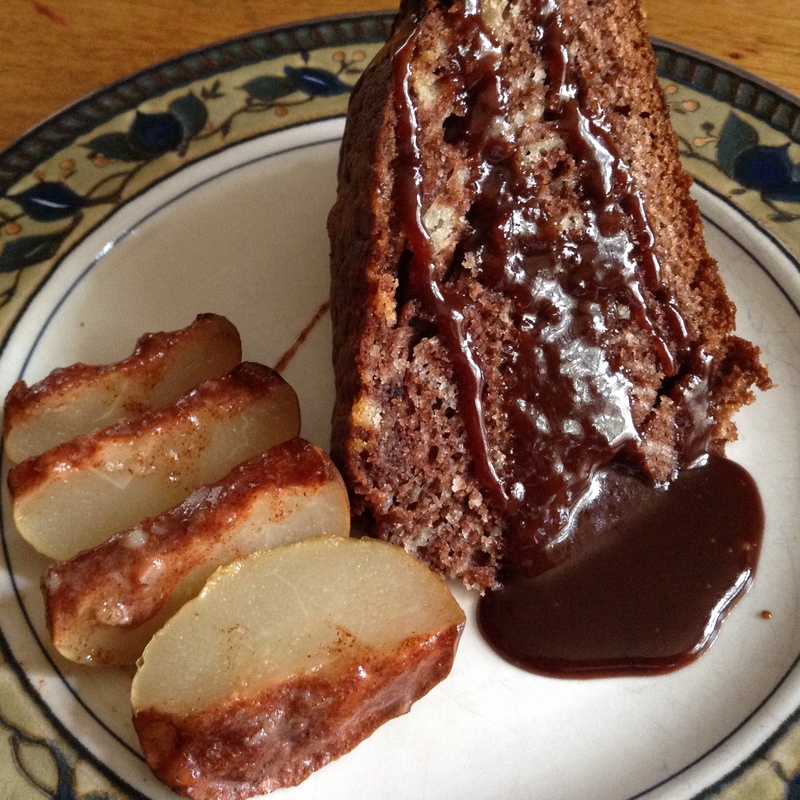 I was quite happy with the outcome of those pears, they were delicious. I was pleased with everything! Simply amazing Lidia. I’m hungry just scrolling through this post! I know what you mean Anne! Thank you for always being so sweet!